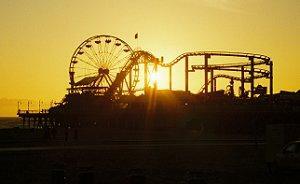 The sun never sets on great ride memories. Old rollercoasters are the granddaddies of modern rides, and despite their age, they offer a range of thrills and excitement that many riders find irresistible. In the amusement industry, any roller coaster can be considered old a mere 10 years after it has been built, but with more than 2,000 roller coasters in the world today, it can be trickier to define just what makes a coaster old. Steel coasters show their age sooner, since there are more innovations available to steel roller coaster designs and the ride that was fresh and new just a few years ago may quickly become outdated when a more innovative design is revealed. Wooden coasters, on the other hand, have fewer innovations and therefore age more gracefully, and a coaster may not be considered old until it has been thrilling riders for 15 or more years. Old coasters often become treasured pieces of nostalgia for several reasons. As rides age, their designs become more rare as similar rides are dismantled. The longer a ride stays in operation, the more guests it thrills and a greater number of people will remember it fondly and keep coming back to relive those memories. Many times, older rides will become designated historical sites by parks, cities, or even the National Historic Register, making them even more iconic. 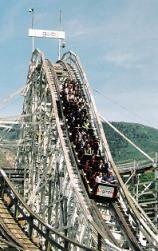 Leap-The-Dips: This wooden side friction roller coaster at Lakemont Park in Altoona, Pennsylvania was built in 1902 and is the oldest operating coaster in the world. While it only rises 41 feet high and reaches speeds of approximately 10 miles per hour, the undulating dips and gentle curves of this historic ride continue to thrill riders, particularly because of its uncertain past. Due to disrepair, Leap-The-Dips was closed from 1985 to 1999, when a successful renovation and restoration campaign managed to preserve this outstanding ride. In 1996, the ride was designated a National Historic Landmark, and today new generations of riders continue to enjoy classic rides on this gentle coaster patriarch. Cyclone: The iconic Cyclone at Luna Park in Brooklyn - also known as Coney Island - is one of the most popular rides in the world. Since it was built in 1927, this coaster has thrilled millions of riders and been reproduced seven times because of its influential and exciting design. Rising just 85 feet tall, the Cyclone reaches speeds of 60 miles per hour and has an astounding 12 drops during its less than two minute duration. The Cyclone became a National Historic Landmark in 1991 and continues to thrill New York residents and visitors every summer. Giant Dipper: This Santa Cruz Beach Boardwalk wooden coaster was built in 1924 and became a National Historic Landmark in 1987. One of very few remaining beach coasters that exemplify the golden age of coasters from the 1920s, the Giant Dipper's half mile track rises 70 feet above the sand and reaches speeds up to 55 miles per hour. Revolution: This steel coaster at Six Flags Magic Mountain is exceptional because when it opened in 1976, it was the first coaster in the world to include a vertical loop. Adding the element of inversion opened the door for dozens of roller coaster innovations, but the 90 foot tall, 45 foot diameter loop on the Revolution creates an impressive force nearly five times the force of gravity, making this ride still one of the most impressive and treasured old rollercoasters operating today. Magnum XL 200: This impressive coaster at Cedar Point amusement park holds a special place in the history of the roller coaster because it was the first to surpass the 200 foot height barrier. While new coasters today have more than doubled that height and easily outpace Magnum's 73 miles per hour top speed, this old coaster marks the beginning of ever more impressive roller coaster records. Batman The Ride: This Six Flags Great America coaster was built in 1992 and was the first inverted coaster ever constructed, marking the beginning of increasingly impressive design innovations that offer riders a range of unique and thrilling sensations. With its five inversions, Batman The Ride loops and twists riders into a wild frenzy, and it continues to thrill park guests today. Old rollercoasters, while important pieces of amusement park history, can be problematic for parks to maintain. As a ride ages it requires more extensive upkeep, dramatically increasing operating costs. Many parks regularly renovate older rides with new safety equipment, more sophisticated computer operating systems, and stronger materials to lengthen the lifespan of favorite nostalgic rides. Replacing a coaster's trains with lighter, more aerodynamic models, for example, may reduce the stress on the ride structure and lower maintenance needs while increasing the ride's speed and making it more comfortable and enjoyable for park guests. In some cases, however, it may be impossible to safely and efficiently maintain an old ride, and it will be demolished or sold. Rides can be relocated to other parks, though many old coasters are disappearing in favor of modern attractions. An old coaster has a nostalgic feel, often offering a rougher, more out-of-control experience than the smooth, powerful contours of modern rides. At the same time, guests need to be aware that while older coasters may not appear as aggressive as modern scream machines, their rickety nature, abrupt dips, and sudden stops can make them less appropriate for riders who are sensitive to motion sickness or who have other health concerns. Old rollercoasters offer a glimpse of the amusement industry's past. Whether a coaster is 20 or 80 years old, standing the test of time demonstrates its ability to thrill all riders, in any year.